Thanks to the environmental movement, there are now more whales in the ocean near Boston than there have been in at least the past hundred years, scientists say. On April 19, 2010 scientists saw a group of right whales in Block Island Sound. Researchers at the Northeast Fisheries Science Center saw 98 North Atlantic right whales. There are about 400 right whales on earth. These photos were taken on a trip guided by scientists from the Whale Center of New England www.whalecenter.org on June 5, 2009. 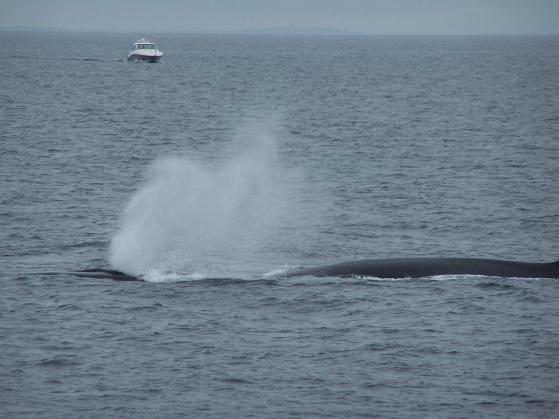 One of the scientists on the trip said she saw a whale jump almost entirely out of the water near Boston in late May 2009. Submitted by Eesha Williams on Sun, 06/07/2009 - 18:11. 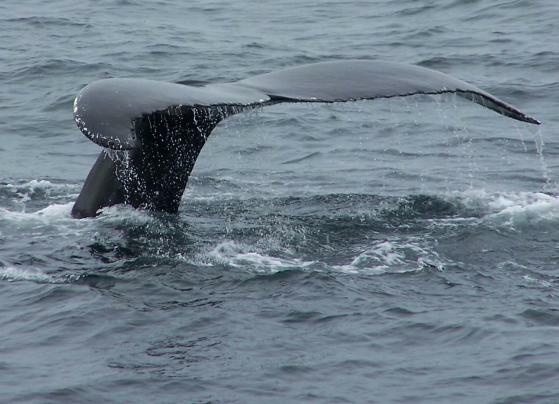 The tail photo is a humpback whale; the other is a fin whale. Humpbacks are the only whales known to sing [as opposed to using sound for navigation]... Humpback whales sing the most during mating season. They sing long complicated songs with repeating patterns. These songs last a few minutes to more than half an hour and can be heard up to 100 miles away.